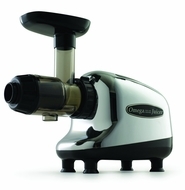 The Omega J8005 Nutrition Center is a masticating style juicer. Sometimes referred to as a low speed juicer, the Nutrition Center processes at 80rpm, whereas most other juicers process at a speed of 1,650 to 15,000rpm. The low speed protects and maintains healthy enzymes, prevents oxidation and allows juice to be stored up to 72 hours without degradation. The dual stage juice processing system extracts the maximum amount of juice from fruits, vegetables, leafy greens, even wheatgrass! You can also use the nutrition center to turn nuts into nut butters (an all-natural peanut butter), make baby food from natural, fresh ingredients, whip up soy milk, extrude pasta, grind coffee and spices, and mince herbs and garlic. Make delicious and nutritious drinks and snacks that everyone will love. Measuring 7in wide, 15.5in deep and 8.5in tall.